document management software selection guide! This document management software requirements and evaluate vendor RFP responses toolkit. Help select the best software! Looking for Document Management software? Use these products to keep even the most complex document management software selection tasks on-schedule and under-budget! Use optimized RFPs to collect vendor proposals for meeting your web-based document management software requirements. Easily use quantitative vendor proposal evaluation and document management software selection tools to identify the proposal best suited to your needs, all using Infotivity's comprehensive decision-making software. Infotivity offers the following to help you identify your document management software requirements and evaluate vendor RFP responses & proposals using proven quantitative techniques.. User needs can be quickly identified during this step by using the Work Distribution Chart (WDC). The WDC identifies situations where users must waste valuable time waiting for, or searching for, or correcting, data needed to complete a given task and other productivity roadbloacks and time wasters. What-If Analysis: calculate how adaptable a proposed document managment software system will be to changing business environments encountered in the future. Cost Control Matrix: helps to control costs in large scale document management software projects requiring confiquration scripting or custom programming. Very useful in Best and Final Offer (BAFO) or similar negotiations. (also Available Separately) . Multiple Importance Levels: Ensure the proposed system with the least risk is selected. Accurately identifies which document managment software provides the most "must have" and "nice to have" features important to your organization at the LEAST risk. RFP Masters templates are now available! Enjoy the benefits of using a professionally written, optimized RFP to query vendors about hundreds of document management software functions when selecting your next document managment system. Complete with project domain checklists & vendor response evaluation guides, these fully detailed RFPs will save time and help you select the document management software best suited to your needs! Visit the Ready-to-Use RFP page for more details. Receive FREE Advice & Support from a Software System Selection Expert! 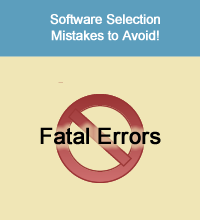 Evaluate & Select Software Systems Accurately! How NOT to Choose Software! "Using your requirements checklist, we did in 2 weeks what it took others three months to do." criteria I have seen anywhere. Extremely useful"
"Thank you very much! I have to say it's quite extensive and well laid out, this is exactly what we were looking for!" Each Infotivity Document Maanagement System RFP Master Template includes everything needed to identify user needs, quickly determine software requirements, prepare an RFP, compare & evaluate vendor RFP proposals, and select the best DMS system for your organization's needs. Copyright © 1989 - 2019 Infotivity Technologies, Inc.
Demo-Script Master Template, and IT RFP Template are trademarks of Infotivity Technologies, Inc.
Excel is a trademark of Microsoft Corp..